Sometimes you can’t sleep – or wake early – for no apparent reason. This morning was one of those times, and at 4.30am I decided to get up for a glass of water….just as the call to prayer began. For me, this is possibly the most evocative sound of life in Turkey, particularly at sunrise or sunset when it signals the start or end of another busy day. So, as I sat there listening to the muezzin, I reflected on the other sounds that are the backdrop to our new life. Most seem to be animal-related – dogs barking, of course; the cows mooing in the neighbours’ field; the cockerel that belongs to the family at the other side. And, unfailingly, the backdrop of crickets chirruping in the orchard, the garden and indeed pretty much everywhere. I’m not so aware of the traffic, though of course it is there. But we are fairly remote so it’s not a constant presence – or doesn’t feel like one. You’ll be offered a good deal on shoes – buy one, get one free – but that is actual shoes, not pairs. Canny, eh? Or the perfume sellers will attempt to draw you in by asking your advice on the popular men’s and women’s fragrances of the moment back in the UK – and of course, they’ll have it right there for you at a fraction of the price. Anyone who knows and loves Turkey is familiar with the “genuine fake” culture. Again, there are those who complain about it – but it’s part of life here. It’s friendly banter with no animosity – if you’re not interested, smile and say so, or tell them you’ve already made your purchases. It amuses me how many people pretend they haven’t heard, put their heads down and scurry past! The threads that join together all these sounds, for me, are peace and/or cheerfulness. So far there is no stress, no anger, nothing negative associated with what I hear in my new life. That may not always be the case, I realise – but, for now, I’ll just enjoy it. 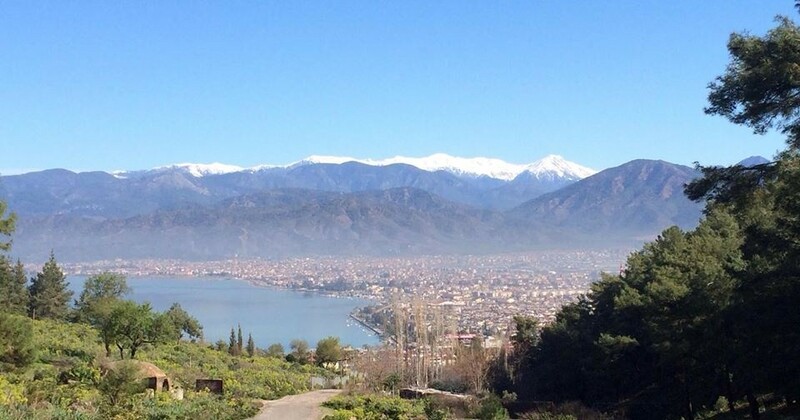 This entry was posted in General and tagged Ölüdeniz, call to prayer, dolmus, ezan, Fethiye, Fethiye market, genuine fakes, Hisarönü, market traders, muezzin on May 29, 2014 by theparsleys. Having spectacularly failed so far to address my billing issue, which has been going on now since March 26 2014, I’ve decided to try a different tack. Your customer service, while generally pleasant, has proved astoundingly inefficient – and amusingly, via social media, advised us that customer service complaints should be directed to….customer services. But I digress. 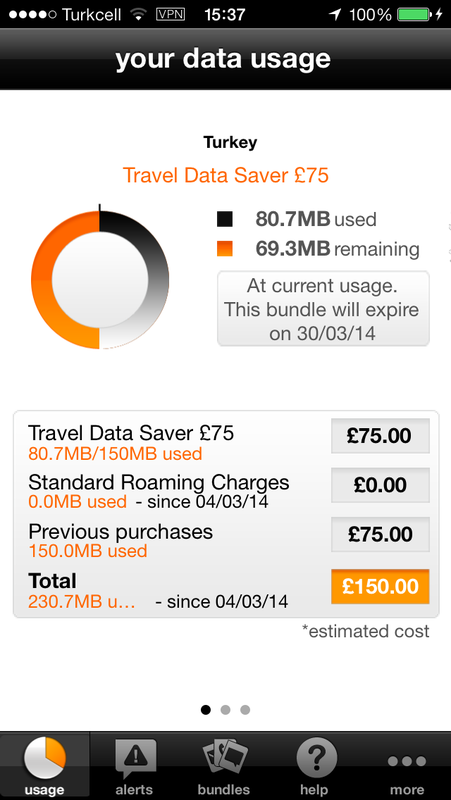 The first screenshot emailed to Orange/EE on 26.03.14 that shows no standard roaming charges are due. Sorted – or so I thought. I was rather surprised, while I was away, to receive a text telling me I was exceeding my usage allowance. I was completely shocked when I called the customer service line – from Turkey, at some exorbitant charge – to be told my bill stood at around £2,000. Yes, folks, you read that right – around £2,000. I spoke to a lovely lady called Deborah who asked me to email her a screenshot showing the app was applying the roaming bundle and was telling me no standard roaming charges were due. She agreed on seeing it that there was an issue; it couldn’t be addressed until my next billing date, on April 15th, but she’d make a note in her diary to call me and help me sort it out. In the meantime, she said, she’d unblock my phone and I should continue to use it and monitor activity via the app as I had been doing. This was March 26. 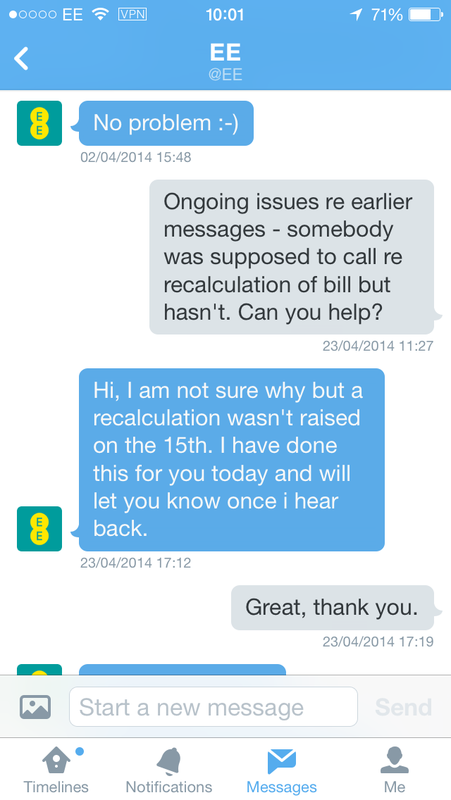 EE say no recalculation had been requested. On April 15, there was no phone call. Two days later, however, there was a bill for £2,129.50. I – perhaps naively – trusted it was being sorted out so, although anxious, did nothing until April 23. Back to Twitter and another email to Deborah. There was no response from her, but the social media bods said that no bill recalculation had been requested. They’d do it, though, and somebody would be in touch. On April 30, when I still hadn’t heard anything, I tried again and called both the customer service line and went back to Twitter. Both said the bill recalculation hadn’t been done yet and advised me to cancel my direct debit, which I did. I don’t like not paying my bills, but I couldn’t risk that kind of money disappearing – especially when I don’t owe it. Did I mention that the app said I’D USED NO DATA THAT WOULD INCUR STANDARD ROAMING CHARGES? 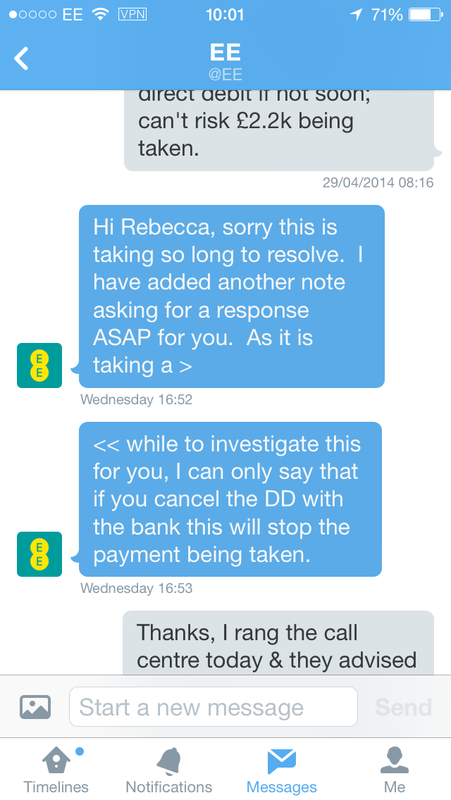 EE advise me to cancel my direct debit. This is getting tediously long now, so let’s skip forward to yesterday, Monday May 5 2014. I missed the call, but picked up a voicemail from a cheery-sounding north-eastern chap who said the bill recalculation had been done and £2,129.50 was the correct amount. Hang on – no, it isn’t. What about the packages, the fact they showed on the app if not the Orange/EE system, and that there was clearly a problem that needed sorting out? Ok, let’s call the customer service centre again. I didn’t catch the girl’s name but she was lovely. Apparently I’d been sent a text saying my attempt to buy a bundle had failed – this was the first I’d heard of that, and I certainly never saw the text. It also doesn’t explain why the app applied the bundle to my account. I explained the story to date and the conversations I’d had with Deborah; the girl said Deborah was working – yes, on a bank holiday – but was on another call so she’d speak to her, find out what was going on and call me back. You guessed it – I haven’t heard a dicky-bird since. I don’t know what to do, Orange & EE. I am not paying you a ridiculous sum of money that I do not owe you. You might say the data roaming bundle wasn’t purchased, but I have screenshots that showed it was being applied to my account and, let’s say it one more time – THAT THERE WERE NO STANDARD DATA ROAMING CHARGES DUE. If I’d used the amount of data shown – 230.7MB – at your usual rates (£8 per MB) then yes, I’d owe you. But the tracking app says I didn’t. I want to sort this out. I have no problem with paying what I owe, although this whole episode has been so stressful that to be honest I think YOU should be paying ME something. I intend to ask people to share this and I’ll be asking the BBC’s Watchdog programme if they’re interested too, seeing as a new series is about to start. It’s the only way I can think of that might see some action and resolution. If you’d like to contact me, you have my number. NB To everyone else who follows this blog – I know it’s not technically a post about moving, but given it’s occurred as a result of our plans I think it’s valid to include it. I also hope it will serve as a warning to other people and customers of EE/Orange. If you buy bundles, track any usage and take screenshots. Make notes of calls, emails and anything else. This happens far too often to far too many people. It’s time it stopped. This entry was posted in General and tagged customer service, data roaming, data roaming charges, EE, mobile phone charges abroad, Orange, Roaming Angel, using mobile phone abroad on May 6, 2014 by theparsleys.